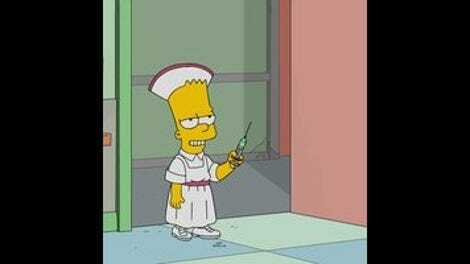 Over its impossibly long run, The Simpsons has done just about everything well. It’s also done just about everything poorly, but, hey, you do a TV show for 28 seasons. A big, high-concept season finale about all Springfield’s canines taking over the town? Why not? I mean, the show’s gone to space, it’s built a monorail, spent most of an episode as a hot pepper-induced hallucination, turned Homer into a singing star, pro baseball mascot, sideshow freak, pro boxer, art world phenom, and several dozen other splashy, episode-driving occupations. And while the most memorable Simpsons episodes traditionally incorporate some more subtle character beats into the shenanigans, shenanigans for their own sake are memorable, too—as long as they’re funny enough to justify the detour into wackiness. In “Dogtown,” Homer swerves into poor ol’ Gil rather than hitting Santa’s Little Helper (they’re both eating out of the same alley garbage cans), and only wins the ensuing civil lawsuit because his slick lawyer plays on the jury’s affection for dogs. Gil’s weaselly lawyer (the weaselly lawyer) does his case no favors by citing all the adorable things dogs do as proof that dogs are worth less than people, thus inadvertently establishing a legal precedent that dogs are worth more than people. Quimby, seeing votes in the town’s newest hair-trigger whim, enacts some “untested, hastily passed, pandering laws” that make Springfield into a dog paradise, ignoring the pleading wisdom of Michael York’s veterinarian Dr. Budgie that those dogs are gonna turn on people once they discover that humans are no longer in charge. They do, chaos ensues, Marge tells off Milhouse’s pipsqueak chihuahua that’s leading the pack (all the dogs immediately show Marge their bellies, which, cute), and that’s that. As far as bare bones go, why not? Again, silly and high-concept can work if the jokes are good enough, especially if an episode manages to ground the silliness in some sort of character work. Failing that, a bold stab at self-reflexive meta-comedy can also power things along. But here, the jokes aren’t good enough to sustain the premise, the character elements are perfunctory and sparse, and, as has been the case for a few years in a row now, the season finale has seemed less like an attempt to go out with a bang, and more like an afterthought. 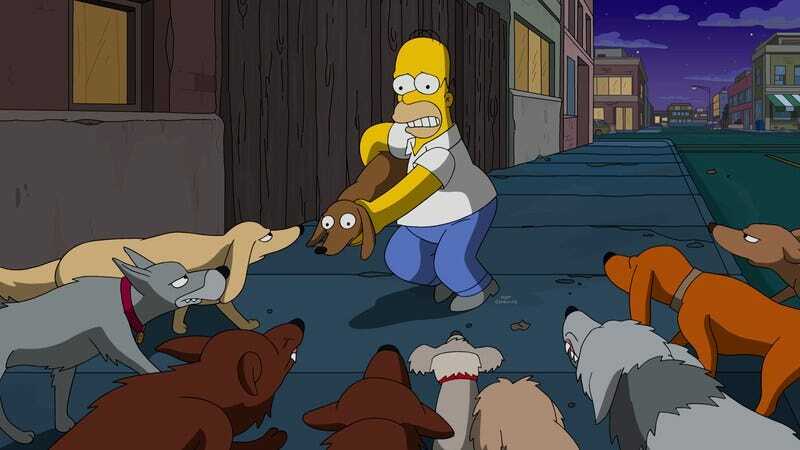 For one thing, while Santa’s Little Helper is the impetus behind the White God-esque dog-pocalypse, the Simpsons’ trusty greyhound barely figures in the plot at all. When the town’s dogs go wild, he runs off, but essentially disappears until the crisis has passed (with Marge punting little Taquito the chihuahua over the horizon, a jarringly cruel thing coming from her). Santa’s Little Helper has flirted with going feral and fearsome before, and there, it was his relationship with Bart that saved the day in the nick of time. Here, Bart worries about his pal’s loyalty, but then the dog just splits, and their bond is irrelevant. The same goes for ol’ Gil, although his extraneousness is played with as just another joke about how extraneous Gil is. There’s a certain element of ol’ Grimey in how Homer and Marge brush off Gil’s disappointment that Marge’s heroism robbed him of the chance to redeem himself in the eyes of the town. Especially in Homer’s line that Gil needs to redeem himself, even though he’s done absolutely nothing wrong but get run over by a car. Still, poor Gil’s story isn’t developed enough to make his arc even the sort-of sick joke it’s intended as. Which may be part of that joke, but, here, it’s even too much of an afterthought to register as that. And Marge’s summation, about our love for dogs stemming from their unquestioning love and loyalty resembling what we wish we got from each other, is sweet, but awfully perfunctory in the scheme of the episode. If ”Dogtown” were simply a non-stop dogpile of solid gags, that’d be something. And there are a few decent ones here and there. I laughed loudly when I figured out just why Homer was laboriously using Snowball II’s claws to pull the exhausted Santa’s Little Helper through the doggie-door, a blessedly long and patient setup to a very dumb joke of the sort that Homer would think so hilarious. And Wiggum, hauling Dr. Budgie to jail for making a dog wait for its pedicure just because of a non-dog emergency, exhibits some prime Springfield P.D. logic with his sneering, “Dogs locked in cages? That’s no way to treat a dog! Now lock him up in a cage… like a dog!” Homer demands the kids pull down the “Purge armor” on the house once the dogs go berserk, which, again, is some fine Homer-esque crisis thinking. Bart and Lisa go looking for their dog, escaping from Grandpa’s watchful eye by cranking the heat in the house up one whole degree (he immediately falls asleep). There are a few other fringe benefits here. The animation is ambitiously cinematic, with the angle when Budgie is thrown into the police car and the shadow work on Homer’s drunken nighttime flight from the newly ferocious dogs standing out especially well. I continue to be tickled at York’s ongoing presence on The Simpsons as a semi-regular—his hoarse, gravelly old man voice as Dr. Budgie fits into the show’s chorus of characters perfectly. Same goes for Kevin Michael Richardson, popping up here in a couple of roles (including a Stephen A. Smith-style news pundit/shouter). In the end, though, as this is the end of season 28, there’s just not much here. Credited writer J. Stewart Burns, a Futurama vet, is clearly at home in this sort of plot-driven event episode—apart from the Futurama crossover, he’s also behind the two big “future Simpsons” stories (along with the deeply regrettable “Hannah Horvath’s tattoo universe” episode), all of which, like “Dogtown,” seem a lot more fun and ambitious in concept than they turn out to be in execution. And that’s a wrap on season 28 of The Simpsons for the A.V. Club, everyone. Thank you, as ever, for reading. And thank most of you for commenting. See you in the fall.